How do I use my product's control panel to automatically send an email of a scanned item? 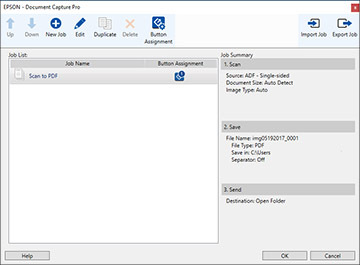 If your product is connected through a network, you can set up a job in Document Capture Pro (Windows) or Document Capture (Mac) to automatically send a scanned item to Outlook or MAPI-enabled email applications. To set up a job for this purpose, see the instructions below for your version of the software. Note: Make sure your Epson product and computer are connected to the same network. Click Switch to Simple View, if necessary. Click < at the top right corner of the screen. Enter a descriptive name in the Job Name field. Select Scan and enter your Scan Settings. Select Save and enter your Save Settings. Select Send and select E-mail from the Destination drop-down list. Select New from the Setting Name drop-down list. Enter an E-mail address for your recipient and click Add. Enter a Subject and Message for your e-mail. Scroll to the bottom of the page and select Account Settings. 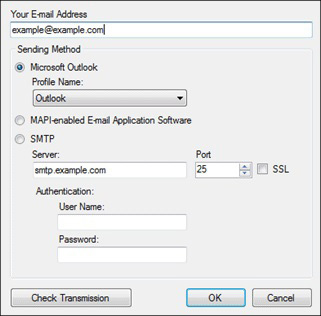 In the new window, set up your e-mail account by entering your e-mail address and selecting your Sending Method and Authentication settings. Click OK. The Job Name will appear in the Job List. Click Manage Job and click + to create a job. Select Output and enter your Output Settings. Select Destination and select Mail in the Destination pop-up menu. In the Destination Name pop-up menu, select Save As and enter a destination name in the window that appears. Click OK. Enter a specific email address where you'd like to automatically send the scanned attachment(s) in the E-mail Address field. Enter the subject and body of the email in the Subject and Body Text fields, respectively. 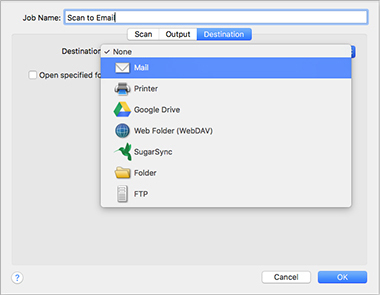 Note: To attach your scan to a blank email, enter a Setting Name and select Check e-mail before sending. Leave the other fields blank. Click OK. The new job appears in the Job List. Click and select Event Settings. Select your new job from the drop-down list. Note: If the drop-down list is blank in Event Settings, restart your computer. Start Document Capture and perform this step again. Click OK and click OK again. The Job Name appears in the Job Settings window. To scan, press the start button on the scanner. Published: Jul 25, 2018 Was this helpful​? Thank you for the feedback!